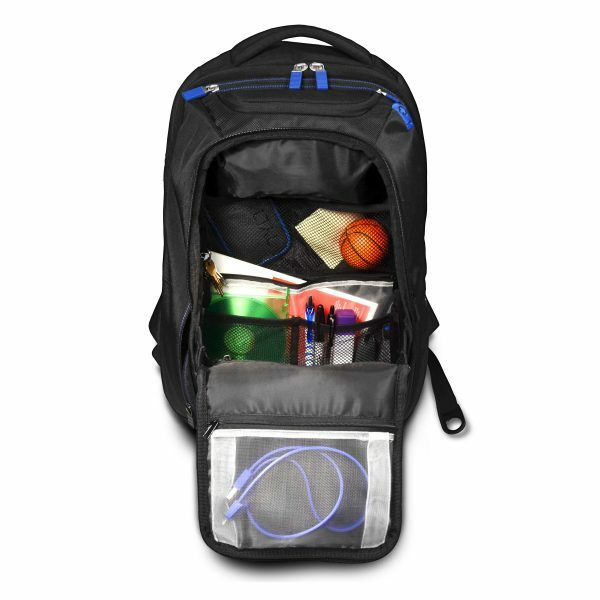 This is probably the most versatile backpack you’ll see. 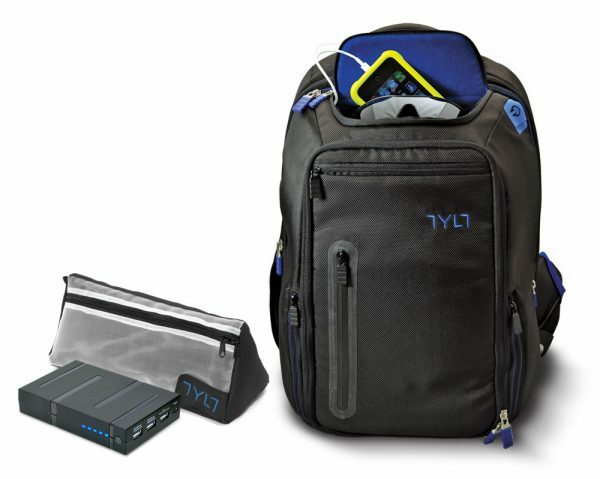 Built with a laptop, tablet, smartphone and sunglasses in mind, it features a built in power pack, and they even throw in a see through bag for when you are travelling on a plane. Talking of planes, it even comes with a back section that lets you slide it on to a trolley. 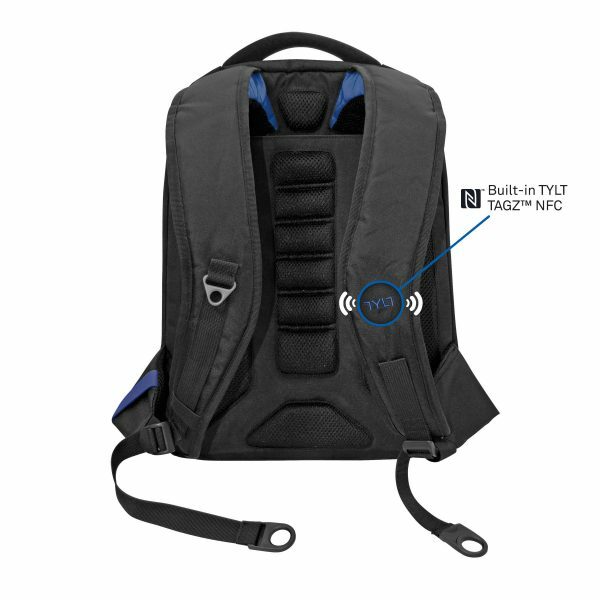 Featuring 13 pockets, USB cables, and cable through holes to charge your devices all over the pack, this one seems to have thought about every thing. Built in 10,400mAh rechargeable Battery Pack, with 3 USB slots, allows up to 4 full smartphone charges or 1 full tablet charge. 1 x 2.1 USB port for charging tablets. 1450 cubic inches of space. Full length zipper on front for airline tickets/passports. Look and feel – pockets pockets pockets! From the face of it, it looks like any other backpack. Yeah, you focus the good material and the brushed metal zips and the pockets, and the fact that it is probably a laptop bag, and it looks a bit more square than the usual bags you see. 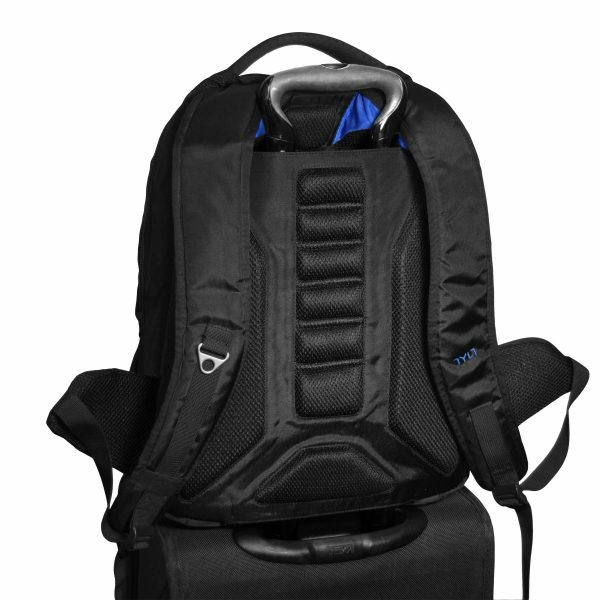 On the back, you notice a padded surface, which allows plenty of airflow while wearing this, as well as padded straps. 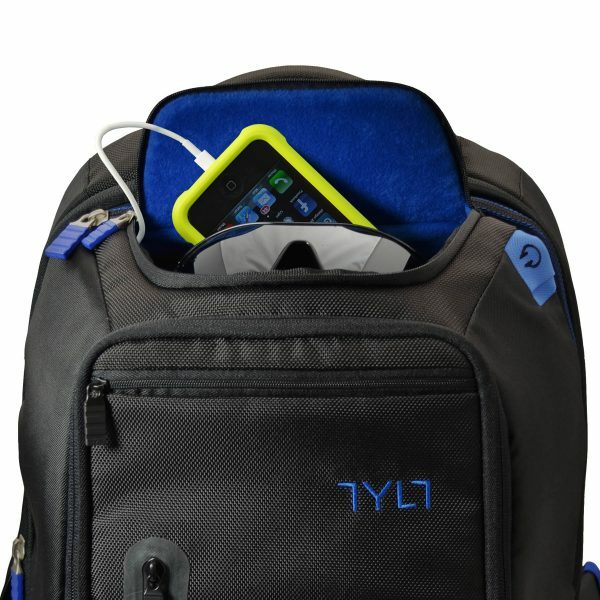 You also notice the TYLT logo which serves as an NFC tag (more on this soon). The right strap features a metal hook to hook other things in such as keys. The bottoms of the straps feature a small zipped pocket on the left and an elastic loop on the other side. It is exactly this kind of attention to detail you will get used to as you look all over the bag. Hidden behind the padded surface is the trolley slot. On the right is a pocket with a cable through hole so you can add something like a music player to charge. On the left side is a pocket which conceals a mesh that lets you store a bottle. The front features a couple of pockets that can prove very handy for the likes of tickets, wallets and passports. On the top is a well protected pocket with some hard shells inside that can hold your phone, your sunglasses, and even has a slot to let you pass your headphone cable out. This pocket also features a go-through slot so you can charge any item that is in this pocket. 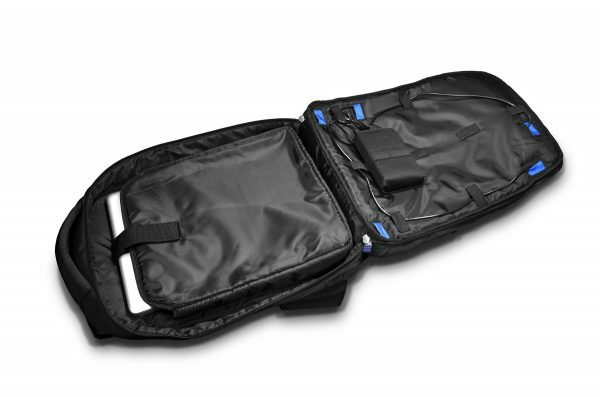 Open the front packet, and you will find plenty of pockets and slots to store, classify and put everything you want for your travels or work. This pocket also features four holes to let your cables in from the battery pack, so you can once again charge any devices in this area too. The see through pack normally goes in here too. Behind that is a pocket which is lined with soft fabric, and is designed for tablets. A cable through hole lets you in any charging needs, and a couple of loops mean you can store cables in there. Any tablet up to 10 inches can easily be slid and stored in here. Open the back pocket, and you find a dedicated slot to put in the battery pack, which is made such that you can see the display LEDs, has access to the on/off button, and the output ports. Plenty of loops allow you to store your cables neatly. The other side features a padded pocket for your laptops. The fact that you can open this out totally means that this bag can act like a brief case as well, making this the perfect companion on your travels. 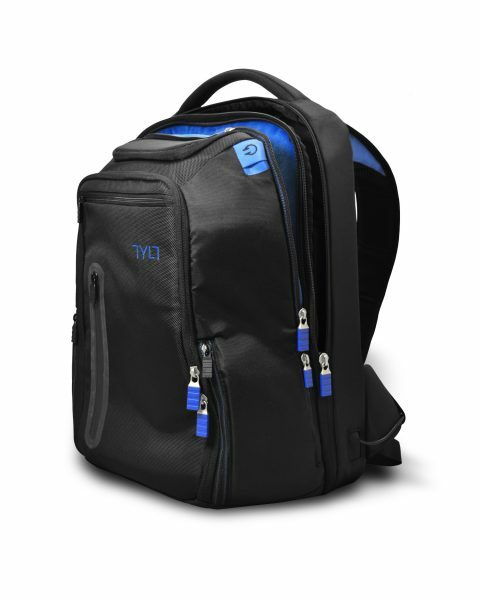 While the bag is full of features on its own, the battery pack is what sets this apart. We have run through the specs already. The battery pack itself is shaped like most of the typical ones on the market, with a micro – USB input port, 3 USB output ports, and 5 LEDs that give you an indication to battery power. The LEDs also indicate when the system is on or off. One of the built in features is that if you don’t use this for more than 10 minutes, it automatically turns it off. This means that you make the most of your power. 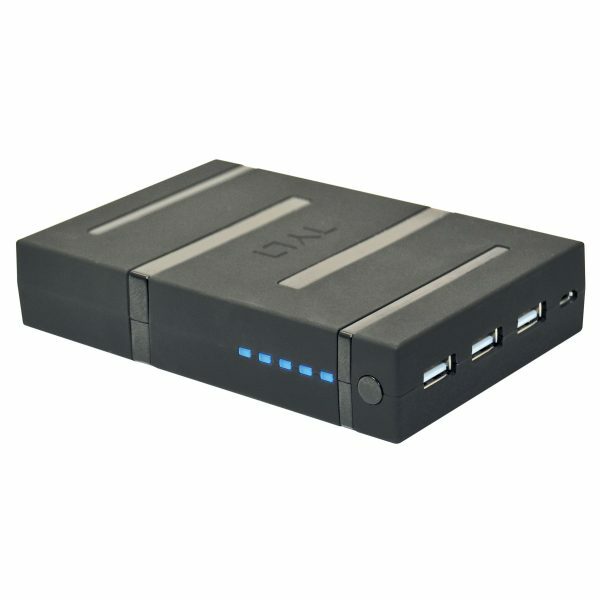 TYLT have very kindly included three micro-USB cables, one of which comes with a 30 pin Apple connector attachment, which means you can charge both Apple devices as well as your Androids, Blackberries or Windows devices. Of course, it being a USB port, you can charge whatever you like, as long as you have the cable. The pack is a snug fit, and while it adds a very minute amount of weight to the bag, it is the only bag that works perfectly with a battery pack, and hence you will never need to ‘remember to bring’ it with you. Have we covered everything? Not quite. Another hidden feature in this bag is the included NFC tag. The tag automatically opens the Trigger app (used to be NFC Task Launcher). You can program this to turn your WiFi on or off, use FourSquare to check in, turn Bluetooth on or off, etc. This means that you can use this as a quick feature to toggle or do something as and when you like with a simple swipe of your phone. Of course, NFC will be needed on your smartphone (or other device), and it will need to be active to make the most of this. NFC is one of those things that is probably not utilized enough, and it is slowly making its way through. Having tags such as these on our devices can help us utilize more of its potential, and we’re all for that! Bags come in a variety of shapes and forms, and they all feature various pockets, but hardly anything seems to throw in as many punches as this one does. This one ticks all the boxes we can think of, and the only thing I could probably add on top is some waterproof ratings to give you some extra peace of mind. This does come with water resistance as standard, but since there are no ratings, we can’t put our name to it. If you do need my word though, this is my new standard backpack. Well done Tylt!